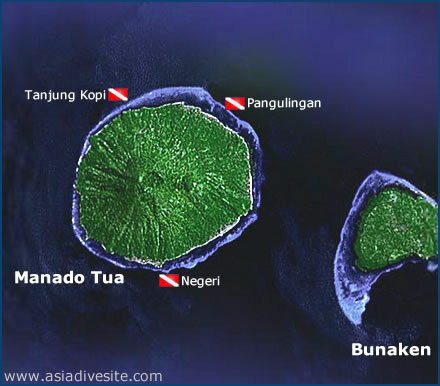 The dormant 820 meter volcanic peak of "Old Manado" lies just north west of Bunaken and can be seen for miles around. Topography here is more steep winding walls with cracks, crevaces and caves. 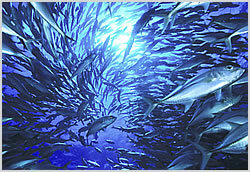 Current is often stronger and visitors often larger, big barracuda, trevally and sharks. A good spot at Pangulingan offers differently shaped reefs, walls and plateaus, often with stronger currents. Fantastic coral coverage and usually huge shoals of fish can be found here. It is one of the better spots in the area. Tanjung Kopi to the north is where to go for the big fish action however currents usually dictate the diveability of this spot.